Investigators are searching for a male suspect who is allegedly responsible for 12 apartment burglaries since February 2017 in Koreatown and the surrounding area. 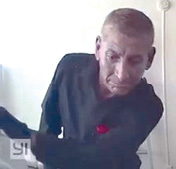 Security camera photographs of the suspect were released on April 30 and authorities are asking for the public’s help in identifying the man. The suspect committed the burglaries at apartments on Ardmore and Leward avenues, and Catalina and Ingraham streets. Police said the suspect entered the apartments by an unknown means, possibly using a key or picking locks. The last burglary occurred on April 24. He usually steals jewelry and coins. During one burglary, the burglar stole a medium-sized safe. The suspect was described as Hispanic, 40 to 45 years old, 5 feet 7 inches tall and 160 pounds. He was wearing a black sweater, gray pants and black gloves in the security camera video. Anyone with information is urged to contact detectives with the LAPD’s Olympic Division at (213)382-6671. During weekends and off-hours, call the watch commander at (213)382-9102, or the LAPD’s hotline at (877)LAPD247.